I want to start off by saying that I did not wake up at the crack of dawn (or stay up until all hours of the night) to see the Royal Wedding live. However, I did DVR the coverage on three separate channels, so I didn't miss anything (I also wasn't sure which commentaries I was most interested in). I used this program to follow along, though I must admit that I fast-forwarded through some of the hymns and such. 1. I love how they found all sorts of people to interview for this, but my favorite random person was the gentleman who taught Kate piano from ages 11-13. He didn't have much to say, haha. 2. The hats ran the gamut from fabulous to hideous. I adored about half, while the rest I found heinous. 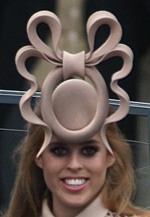 Princess Beatrice wins for worst hat, in my opinion. Seeing all of the hats make appearances makes me want to try to re-launch hats. The summer I was 15 I wore a hat most everywhere I went... it didn't catch on. 3. I found out last week that Kate wouldn't automatically be a "Princess," but was surprised about the number of titles that the Queen bestowed upon William and Kate - Duke and Duchess of Cambridge, Earl & Countess of Strathearn, Baron & Baroness of Carrickfergus. "Princess Kate" is not technically true, since she wasn't born Royal. She will be, however, "Princess William." 4. I enjoyed watching the Princes ride in the car on the way to Westminster Abbey - it was fun to see them wave and smile and ride. I was intrigued that they tan two or three minutes late... it seemed that everything was so carefully coordinated! They rode in a Bentley, Mrs. Middleton and her son rode in a Jaguar, and many of the others arrived in Volkswagen vans. 5. Prince William is a bit balder than I thought. He's also beyond his peak cuteness... I guess that was three years ago or so. 6. I hadn't realized that the chairs for the service would face the aisle... I am only familiar with them facing the altar, I guess.It also interested me that only about a thousand of the guests would even see the ceremony... everyone else's view would be blocked. 7. I found Mrs. Middleton's outfit to be fabulous for a mother-of-the-bride. It's precisely the way I imagine a proper mother-of-the-bride would dress. 8. I had goosebumps as the first glimpse of the dress was seen in the Rolls Royce... it was so neat to hear the commentary "there's definitely a veil!" "the hair is down!" "she's covered her shoulders and arms," etc. I found the dress to be absolutely lovely. Not a style I had ever considered, but beautiful on her. There have been many comparisons to Grace Kelly's wedding gown, and it has been said that Kate had a heavy hand in the design. 9. It was interesting to hear about how relaxed both Kate and William looked before the ceremony... if I was about to have Her Majesty the Queen as my grandmother, I'd be weak in the knees! 10. The bells were lovely. 11. Prince Harry seemed to be very enthralled with how gorgeous Kate looked at the altar. 12. The handing over of Kate from her father to William via the Archbishop was different. At least I hadn't seen it before, anyway. 13. I would have enjoyed seeing the other carriages a little bit... we didn't see the one with Pippa and only a single glimpse of the one with Harry. 14. I also found the entire race-to-the-palace thing to be interesting.... people who waited near Buckingham all day ended up having less desirable places in comparison with those who marched there on the streets. I think my favorite part was seeing the thin line of blue-outfitted police officers being the perimeter of the throngs. 15. 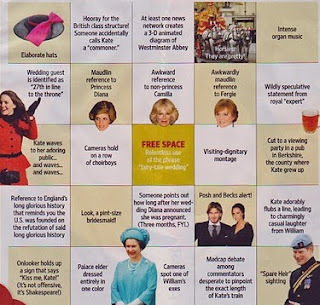 People betting on how many seconds the Royal Kiss would be was kinda funny. The fact that it was extremely short amused me... was that even a second? oh! and then they gave a second kiss! cute! I'd love to say that the flyover impressed me... but I felt it was pretty average. Perhaps I've been spoiled by the many flyovers I have seen at Florida State football games, LoL! Additionally, my thoughts on the various commentaries - lots of mistakes on FOX. Too many people talking on NBC. Great explanations on BBC. I'm very glad I DVR'd multiple coverages, as the camera angles and what they chose to show when were a little different. 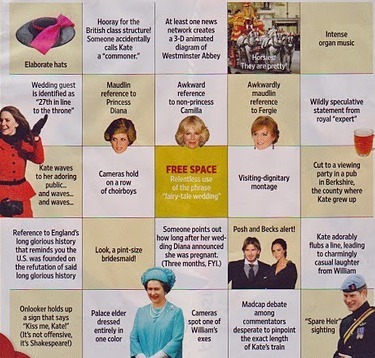 Lastly, I'm not sure if any of you played along with the BINGO board provided in Entertainment Weekly, but I found it to be quite amusing, so it's below for your pleasure.